Born November 7, 1837 at Muncy, Pennsylvania, he enlisted as a Private in the Chicago Dragoons in April 1861 and in September was appointed First Lieutenant in the 8th Illinois Volunteer Cavalry. Throughout the Civil War, he served with the Army of West Virginia, the Army of the Potomac and the Army of the Shenandoah. He was advanced to Captain in February 1862, Major in September 1863, Brevet Colonel, October 1864, for gallantry at Opequon and Winchester and Brevet Brigadier General for services in the Army in March 1865. He was mustered out of the volunteer service in March 1865. 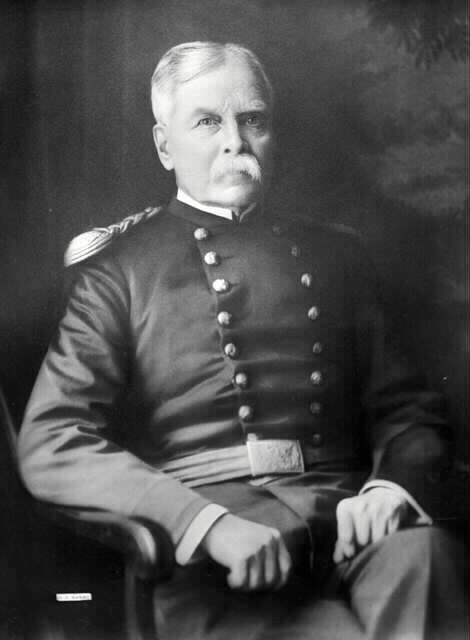 In July 1865 he was appointed Major of the 9th U.S. Cavalry. In 1867 he received brevets in the regular service to Lieutenant Colonel and Colonel for actions in the Civil War at Dinwiddie Court House and Five Forks. From 1866 he was continuously on Frontier duty. In the Summer of 1868 he was ordered by General Philip Henry Sheridan, commander of the Department of the Missouri, to recruit a party of "fifty first-class hardy frontiersmen" to scout the Indians of Kansas, Nebraska and Colorado regions. He took to the field in August. On September 16 he made camp on the Arickaree Fork of the Republican River, near the present-day Wray, Colorado. At dawn the next day the scouts were attacked by nearly 1,000 Cheyenne, Sioux and Arapaho Indians led by Chief Roman Nose. He and his men retreated to a sandy island in the bed of the river and dug in. They stood off repeated charges by the Indians, during the first of which Roman Nose and Forsyth's second-in-command, Lieutenant Frederick H. Beecher, were killed and Forsyth wounded three times. The scout's horses were killed and but for them there was no food. Four more men died in subsequent skirmishes, and the siege was maintained for nine days before relief came, just in time, in the form of a Company of black troopers of the 10th U.S. Cavalry from Fort Wallace, Kansas. The engagement became known as the Battle of Beecher's Island, honoring Lieutenant Beecher. He was breveted Brigadier General, U.S. Army, for that fight, and later transferred to the the 4th U.S. Cavalry in the Southwest and took part in the Apache Wars. In 1869-73 he was Military Secretary to General Sheridan and in 1878-1881 Sheridan's Aide-de-Camp. 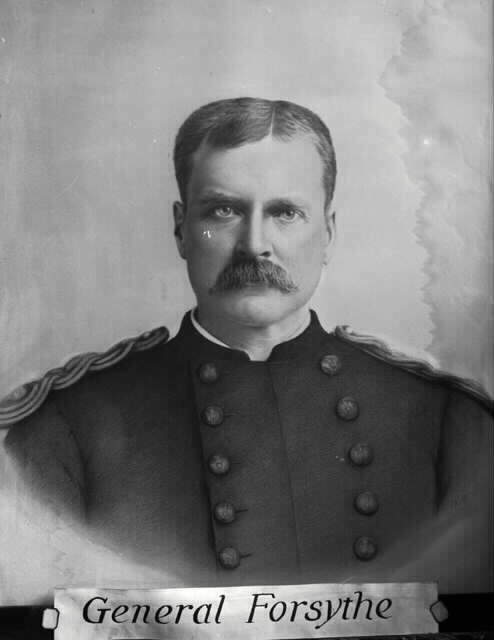 He retired from the Army in March 1890 and was promoted to Colonel on the Retired List in April 1904. "Intrepid Soldier and Christian Gentleman." During his life he wrote "A Frontier Fight," for Harpers Magazine (1895); "The Story of the Soldier," (1900); "Thrilling Days of Army Life," (1902). George Beaumont Forsyth, son of George Alexander Forsyth. July 5, 1894-March 25, 1895. Natalie Sedgwick Beaumont Forsyth (1862-1923), wife of George Alexander Forsyth and daughter of Colonel E. B. Beaumont, whom he married in 1885. 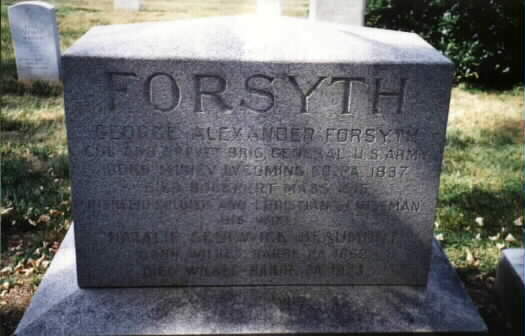 Alexander Beaumont Forsyth, son of George Alexander Forsyth. August 5, 1886-May 7, 1890.